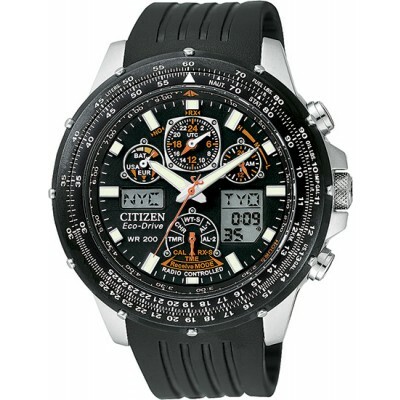 3rd Generation Skyhawk Atomic Flight Chronograph. Atomic time keeping. Time is automatically set (or on demand) by the atomic signal. Multi-band atomic receiver - receives atomic signal in North America, Europe and Asia. Eco drive technology charges in sunlight or indoors with 6 month power reserve. Power reserve indicator with low charge warning. World Time with 43 cities. Greenwich Mean Time (GMT) display. Black dial with silver tone hands and markers. Digital display. Non-reflective scratch resistant mineral crystal. Soft black rubber strap with push-button deployment clasp. Case measures 45mm diameter by 15mm thick.